Now you have my full support on the Davinci Catapult! It, indeed, shows the grace and valour of the craftsmen of the High Elves. I've read some more reactions here about siege weapons not fitting to Elves. People let me say something to you: EVERY faction should have trebuchets/catapults, ballistas, ladders, siege towers or similair stuff. If you take the real medieval world into consideration; do you think that the French only used Trebuchets, while the English only used catapults during sieges? Ofcourse not, you use different siege weapons for different situations, and be it Elves or Orcs, there is no way that the race is a factor in whether a siege weapon is used or not. 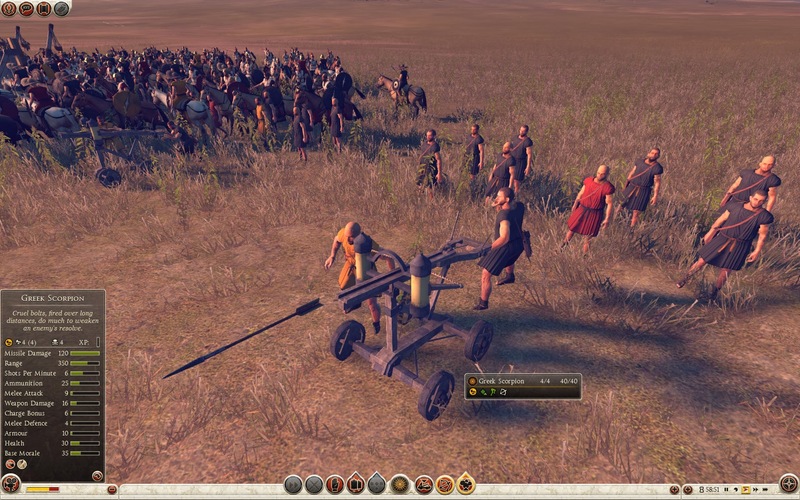 Ofcourse it would be ridiculous to include all kinds of siege weapons to all factions in the mod; but it's just how real life worked . Let's look at it this way, if the Elves of Rivendell were to besiege the Black Gate, would you believe that they could take it without any sort of siege engine? For something as massive as the black gate you would need big ladders or, even better, siege towers! As for Rivendell not being the place to build siege weapons, that's not true. For example, trebuchets were not battle-ready rolled towards the besieged castle. They were disassembled first, put on a cart, and those parts were driven to the besieged castle. When in range, those parts were quickly assembled and constructed into a fully functional trebuchet. I wouldn't be surprised if the Elves of Rivendell did the same with their siege weapons. I personally am still against the idea of lightbringers, but let's just see what Edain will come with . EDIT: Btw Hoho if I'm not mistaken those are called Roman Scorpions? It would work too for the High Elves. I would compare the High Elves with the Romans because of their great civilization and knowledge compared to other nations. The roman catapult is indeed a nice toy, but looking at it, ij just gives me more of a Dwarven feeling. Dunno, it can be adapted of course. Thruthfully, currently the Elves have the less siege equipment, in terms of quantity at least, for Lothlorien only has Ents, though they are very versatile, and Galadriel. As for Rivendell, for now there are the catapults. I wouldn't put it past Elves to use ladders, given their agility and craftiness. Could make up for the momentary absence of rams. About the siege weapons constructed on the site, yes indeed, and in other games there are such mechanics, to the point of the weapon being unable to move unless de-assembled. I just don't see Rivendell itself as doing so, but not because they can't, just mental closure on my part I think, sorry. After all, there is space in the game's base, so the argument's not really valid. I am with Fredius on this one. Studying the elements is an interesting way to see the Lightbringers to be put to use, but it took Maiar (and up) and incredibly powerful elves of Galadriel caliber to make use of magic. I'd be pro generalisation of siege engines and units among all factions if no lore points towards them, which seems to screw with lore less than having all these magical powers flying around. I really think both the roman scorpion design and the Da Vinci catapults are both really good designs. I've always personally believed the Noldor had siege - as said, they were the ones who 'sieged' Angband, after all. The sole issue I had was that I could not think up a befitting design, but both of these are in my opinion unique enough to represent the ingenuity of the Deep Elves. Btw Hoho if I'm not mistaken those are called Roman Scorpions? The Scorpio is supposed to be a large crossbow (or a scaled-down ballista) that was primarily used as anti-armor. Well, even scorpions could be interesting to consider, no? I mean, Noldors have kept at bay Evil forces since...well, ever, must be a reason for that, plus, it'd be a nice, historically-accurate addition. As I wrote on Moddb, I have exactly the same opinion as Fredius. Lightbringers are not at all canonical and elves are enough clever to know the basic physics of siege engines and use them when they are necessary. Balistae, catapults, rams... I think they all fit if they just get an aesthetic tweak. 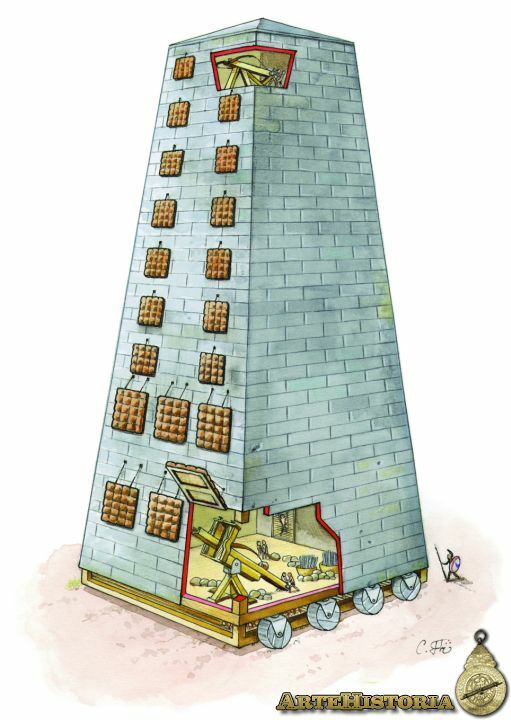 I just want to bring into consideration one siege engine more, the helepolis. It's an highly effective (helepolis means "City conquerer"), higly complex, classical siege engine from the ancient Greece. Basically, it's a huge siege tower armed with lots of ballistae that shoot through windows. 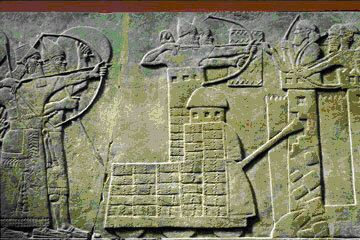 There is also an assyrian version of this weapon, but instead of ballistae it has archers inside and a big battering ram. Movement is achieved by a mill-like mechanism inside the tower, so no external operators are needed. It could be nice if it could engage the walls to allow soldiers to climb and attack the rest of the buildings with ballistae/ram. Of course, everything with that Noldor touch. Duuude that siege tower's wicked! That's what they must've used for the Siege of Angband! Epic, really epic, but I find myself asking if it could possibly be a bit overkill, with how strong Imladris units actually are? Then again, there's no good faction that has the possibility to get on enemy walls, so this tower in Noldor style would look real nice. Those ballistae are not too big, maybe we can go with lots of shots but relatively low damage. If not, unit cap and high price (Imladris style). I see more problems in the size because Imladris is a castle faction and it won't fit through the door. Maybe it's created as a builder team that has to take extra time outside to build it. Maybe it is created in an outpost/settlement. First of all: Yes, the helepolis looks awesome. However, if talking about the skills of the Noldor, we have to differentiate very careful between being great craftsmen, that make beautiful works of art (like the elves or the dwarves) or if your works are shown by destruction and devastation like Mordor (and the book Isengard being it's emulator). Therefore I not really certain if such enormous engines fits the theme of the elves. Also, I'm not entirely sure about a technical point: It could be that wall-climbing-machines (like ladders and siege towers) can't cross gates. It sounded a little bit like that's the case whenever the idea was made to give Mordor or Isengard walls. A last word from myself towards the Lightbringers: I am now double interested in how Imladris will finally look! I think, their new concept looks far better than the old one and I'm very curious how it will play out. Yes, they will probably still use a little too much direct magic, but decreasing their numbers is the first big step as well as making them less fundamental (being the former siege unit). Personally, I'll just wait and look what is made of the Lightbringers for I enjoy this change. To make it clear: That are only my own thoughts.^^ We didnt talk about the lightbearers yet, but we are in agreement that something needs to be changed. Great, that you like the idea of the Da Vinci catapult. But Angabad fell -or most of it- because of Ancalagon's defeat (he fell and destroyed the towers and a bit more); but also yes, they did siege it, but werent that successful: Morgoth still could send troops out. I suggest to use DaVincis catapult model BUT instead of working as a catapult, it may throw a golden spear/arrow/something? 2.1. The point is that this machine will be pulled by four-six elves very well armored & when they stay infront of the enemy base they will start to bulid-arm it, then after a while -maybe 30 secs- it will be ready to attack! 3. This will be truly unique & powerful, but also, will be slow. Maybe it could be the most powerful of the siege machines. This is really interesting discussion. I will not try to repeat too much, but l am completely against any usage of lightbringers! I will respect every decision of ET in term of them, but they are completely out of place in my opinion. I understand that Rivendell is treasury of knowledge (like Erebor is treasury of gold mainly) but presence of lightbringers as siege weapons, isn't my cup of tea... Simply leave force over elements for Maiar. I simply look at Elrond as "water bender" mainly because of his ring also Galadriel with her powers etc. Simply keeper of knowledge as those lightbringers shouldn't be able do do anything similar to elemenal bending... Some more realistic picture is needed in their case. Concerning siege weapons as siege wepons, I agree with statement of Fredius. Simply I agree that Noldors were able to build and use ram, same with catapult, as with balista. There is no need to be so conservative about siege weapons in this term. It maybe look strange, but I think that siege of Angaband wasn't with bare hands or swords and bows. Same and more close situation to Rivendel and Noldors from Middle Earth is siege of Barad-dur. Ok there were Numenoreans, but again, I think elves had some siege weapons also. All what is crucial is that model of that siege should be Noldorin style. Noldorin, not elven in general, because take into consideration that they were warriors and smiths in first place and after that artists and singers. Some opposite to Vanyars and Telerin in that term. Concerning current suggestions, I really like and support that Da Vinci catapult with elegant firing mechanism. It has really nice model. Also that High Elven reaper thrower looks nice, it has classical mech of balista so it is real stuff. That siege weapon has already a nice design, and it could be adjusted in Noldorin style easily. It bolts are maybe more oriented as mass slaying stuff, but what I really liked in that model is hitting animation. That kind of siege could be used as anti mass, anti gate and anti stucture except walls. Some kind of ram is also something which should be reconsidered. From animal symols which could be used, maybe eagle head motive (we already have wolf,ram heads, can't remember is sige ram from rohan based on horse head look)? Just writing down some random thoughts. Water, earth, fire, air and other "Avatar bending stuff" I would like to see only in hands of heroes/maiar. Also water/singing beding siege weapons sounds cool, but they are completely out of place in my opinion. Who played game LotR: War in The North, there was that idea about sound, when two dwarven warriors are blowing some dwarven horn which produces sound of pitch frequency which corresponds to frequency of autooscillation of stone and brings whole Mount Gundabad down. It is cool, but not so eleven in general. And that kind of machine should be very close to structure (or inside stucture) so it could work in general.